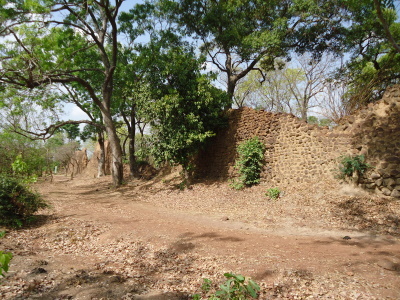 The Ruins of Loropéni are the stone remains of a 1,000 years old fortified settlement that came to play an important role in the trans-Saharan gold trade. Gold was mined here in the 15th/16th centuries, and probably as early as the 11th century. The site, mainly consisting of ruined walls, has been out of use since the 19th century and is overgrown with trees. Just visited (March 2014), while in Burkina it's quite easy to see. The most convenient big town to start with is Gaoua (the capital of Sud-Ouest Region). Small buses from Gaoua to Banfora via Loropeni depart from downtown (not from the main bus station), while in Loropeni (one hour drive on a dirt road) you will be dropped in the center of the town, where from there is around 4 km to the ruins (in the direction of Banfora), if you dont want to walk, you will probably find someone with the motorbike to give you a lift (should not cost more than 500 CFA). 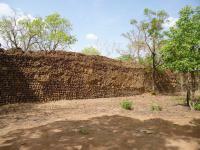 Ruins are not visible from the main road but they are well marked (entrance fee 1500 CFA + 500 CFA for making photographs). Half an hour should be enough to see all the site (it is not big) but remember to take plenty of water with you as there are no shops / other ammenities on the spot. If you go furter to Banfora there may be an evening bus (small) there, if not in the center of Loropeni there is very basic (no electricity, water in a bucket) hotel (auberge) to stay in. We visited this site in 1996 when travelling by with a rented car we noticed these big ruined walls. We were quite surprised by such kind of architecture in West Africa and tried to ask local people what it was. For some it was an old warehouse for slaves for others an old warehouse for different kind of trades. If you are travelling in this fascinating area of Burkina Faso a stop is worth if you are interested in african story and architecture or if you are a WHS collector. Obviously at that time there was no ticket and no warden. Archaeological potential: "The property which was finally deserted in the early 19th century is expected to yield much more information"